This past weekend, my wife and I made an interesting excursion. We live in one of the most interesting places on earth for archeology. Our home in southwestern Colorado was formerly inhabited by an ancient Indian people. Numerous generations known as the Anasazi, lived here from between 700 years and 3000 years ago. Our trip took us to see the country’s oldest protected archeology area; the ruins of an ancient walled village with hundreds of rooms. Dozens of these were ceremonial kivas. The kivas are circular, subterranean rooms that were accessed with ladders through openings in their roofs. They were used as places of worship and ceremony, and it is unclear who was able to use them. I am making a disclaimer for this article: I will be writing from my perspectives, and may therefore deviate from historical accuracy. But having been in the business of making doors and windows for so long, and having poked around these parts for much of these past 35 years, I think I can tell an interesting tale! Anyway, back to the Anasazi. The term has a couple of divergent meanings. One meaning, purportedly emanating from the Navajo people is that Anasazi means ancient enemies. I don’t know that this is really what the Navajos think, but supposedly Anasazi spirits were not considered benevolent to the Dine people. The Anasazi have a history of death by violence, and even indications of cannibalism, so it can be understood if the memory of them is tainted. The second definition is that Anasazi means “those that came before us”. This would express a measure of respect towards people who came into this land as we have, and did what they could to survive. They came, first building primitive pit houses, then graduating to masonry pueblos, and finally to constructing the fantastic cliff dwellings that are now of great interest in our region. Following is a brief description of the evolution of local architecture. The first visible signs of dwellings were the pit houses. These were excavations into the ground, most often in fields where digging was easy. Once a cellar was made deep enough (remember the digging implements were not modern steel shovels, but shaped pieces of wood and rock, a real pain to use), the hole was covered up with branches and logs, or hewn by the most rough instruments. With enough wood and brush cover, dirt could be mounded on top to create run-off and insulation. A simple doorway at one end of the cellar was left, but I know of no artifacts indicating that the pit house ever had a door. Think about the early people; under cover, under ground, huddling together under skins and leaves, trying to stay warm, possibly with a fire filling their pit home with smoke, needing the doorway to be open for oxygen and frequent coming and going. It was probably discovered that the smaller the opening was, the easier the place stayed warm and less snow penetrated. Quite likely, the pit house opening was made like the opening of an igloo; small so you had to drop to hands and knees to enter. Over time, building methods improved. From my understanding, it was over a period of hundreds if not a thousand years, that the ancient people figured out how to take building literally to the next level. It was discovered that by piling rocks along the ground surface, the pit height could be extended without more digging. Likely, while women did the digging (extrapolating from watching men and women build homes in Africa), men gathered rocks from the neighboring hillsides to pile along edges of the hole. It was discovered that by placing rocks systematically, and organizing them into nice walls, roofs were easier to construct. Thus the beginnings of the pueblo was born. The pueblo is the immediate precursor to our modern buildings. 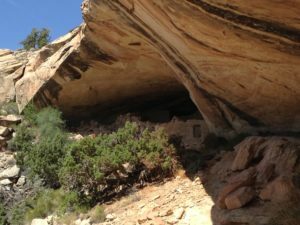 There are many fine examples of Anasazi pueblos in our region, and many more examples of pueblos built later by other tribes, such as the Hopi, that are still in use today. The pueblo is a building made of local rock, mostly sandstone, which is not only stacked in strong, organized walls, but has shaped edges and mortar to fill cracks between each rock. The mortar was created from clays readily found in the soil nearby, which when mixed with water, became a malleable substance that not only filled cracks, but served to keep everything in place, sometimes for thousands of years. It is delightful to study the mortar in these dwellings, and find in them the fingerprints of the craftspeople who applied it. And so the first modern pueblos were constructed. Pit digging efforts were abandoned in favor of rock stacking. Walls, sometimes three and four feet thick were erected, with strong mortar, to create airtight barriors for the first time. And because technology was improving along with construction methods, builders could control how trees were felled and shaped. Many fine stone axe head artifacts remain, and with the ability to shape wood, came the first vigas, or beams that spanned the top of walls creating the roofs of pueblos. While it is conceivable that the ground dwellers fashioned the first doors with branches and possibly skins, it is the Puebloens that demonstrate the first stone doors for their buildings. Often the slabs of sandstone that were shaped to fit masonry openings were found nearby. Denizens would fit and secure the slabs at night, and would prop them open during the day. Windows were largely left without cover, probably to ventilate fires within, and to be able to see out of. Windows were generally too small to use as entrances, and were safe to leave open. In some places, it is thought that windows were placed to allow the sun to enter in a certain way, which helped determine the solstices. Yet as cumbersome as they were, buildings finally had rudimentary doors; just don’t let the heavy slabs fall onto your toe, or toddler, which over the many generations probably happened a few times. Doors a thousand years ago would be used primarily to keep warmth in, much as they are today. Additionally they served for privacy, keeping out rodents and in the case of the Anasazi in their later years, to protect from assailants. Back to the site my wife and I visited. It was a large village, that had seen a significant archeological study over a four year period about a decade ago. The study shows photographs of the excavated dwellings, and some of the artifacts found in various rooms. There were axe heads for the shaping of wood, as well as jewelry, pottery, and other implements of daily life. Bodies were also found. While some of the remains were interned by the way of customary treatment of deceased, burying the dead in the floor of rooms, other bodies were found in violent disarray. Bodies strewn about in random poses and places, some showing marks of violence, could be identified as a trend in the final days of these Anasazi communities. Several of the ruin sites in the surrounding area show the same kind of disturbance, and even indications of cannibalism, as a symptom of a regional exodus. Even good doors would not have held off determined attackers for long. The assault on vulnerable pueblos in the valley floors forced Anasazi to begin construction high up among vertical canyon walls. The cliff dwellings are truly spectacular. They were highly defensible because of how inaccessible they could be. Often long ladders or carved hand and foot holds known as moki steps were the only way to get into dwellings. Other places had narrow sidewalks leading into ruin sites, spots where it would be easy to push an unwelcome visitor to his death with a stout pine pole. Here because of protection from cliff overhangs, the ruins are well-preserved. Often whole buildings are solidly intact, and doorways will have old doors still sitting where they were left as the last inhabitants departed. Again, these doors were shaped pieces of rock, chiseled to fit snuggly into their openings. Learning a little about this culture makes one highly curious to learn more. It is indeed one of the wonders of the world. The next cultures to arrive were the Navajo people, who also built structures from resources available on the land. The Navajo build a circular building often out of vertical pieces of wood, bound together and infilled, called a hogan. The hogan is not nearly as permanent as the pueblo, which is fitting to the nomadic nature of the people. The early Navajo would have made the precursor to the modern door. Having more sophisticated tools, and later even having the use of steel, the Navajos were able to work wood. A door would be fashioned out of an assembly of sticks and branches, woven into a single slab, using a variety of fibers. Navajos later had the ability to assemble wood into boards, which could even be hinged to the hogan, using straps of raw hide. The first European settlers made the same kind of doors. The indespensible tool to bring along in an attempt to settle in a wild, new land, would be the saw, and the ability to hone, sharpen or repair anything. Saws were made of steel, with wooden handles, and a variety of saws were used, each with a specific purpose. The settler would bring along other steel items, such as cut nails, that could be used in all sorts of woodwork and construction. A re-saw blade, is a saw used specifically to create boards from a roughly dimensioned piece of wood. In the days of the first settlers, the re-saw blade might have a handle on each end, so it could be worked by two people at once, for less effort. It would not be uncommon to see a man and his wife, each on either side of the blade, sawing through lumber to make useful boards. I’m sure this whetted the appetite! Kidding aside, the amount of raw work in those early days is probably unthinkable now. Survival is a tough motivator, and all you have to do is re-saw down the length of one board to appreciate how much effort went into almost every chore. The man and his wife could probably saw 6 pine boards out of a log in a good day, and have the raw materials to make the first door for their cabin. Planks were useful, because they spanned a wide area, and with 5 boards trimmed to length and lined up together, would serve to cover an opening. Next would be the step to hold the boards together. The sixth board was sawed in half, each half placed horizontally across the five that were lined up side by side. One piece was placed across near one end of the group of boards and the other half was placed near the other end. The sack of cut nails came out, and the settler drove the nails through the horizontal piece into the five planks below. He did this in the dirt, so that nothing would obstruct the nail as it passed clean through both boards. Each plank would receive up to four nails for a good solid connection. Once both horizontal pieces were nailed securely to the vertical pieces, the door would be flipped over, showing the protruding nails, which were dangerous. Any scratch in those days could easily become a lethal infection. The nails needed to be “killed”. “Killing” is the actual term in bygone days for hitting the sharp end of protruding nails with a hammer, bending them over to flatten them against the wood. The bent over nails served the purpose of trapping the joined pieces of wood. When doing this step in making a door, you were “killing” the nails. Hence the expression “dead as a door nail”! Like the Anasazi before, the frontier family had cause for relief to finally have a door. Next it needed to be hung in the doorway, which in those days was accomplished through a series of leather straps, nailed to both the door, and the door frame around it. Leather works pretty well as a hinge, as it is quiet and pliable, and fairly long lasting. The new door, with its soft hinges and fresh wood, needed only a latch to be complete. Latches and receivers were fashioned out of wood, and may have employed a few nails to secure into place. Then as now, a door is a lot of work, but is the final touch in securing a home. Time to celebrate the new door, warm and secure in a home environment! Doors have been an integral and important part of life for a long time. My first ever blog response… I thought you old web site was nice, but this is fresh… and a nice blog. Thanks, now I know what “dead as a door nail” comes from. I’m from Michigan and have traveled out in your area of the country a few times – every region has its highlights, but you truly are in a beautiful part of the country – the natural beauty is spectacular. Two years ago I made a trip with my son to Mesa Verde and the Canyon of the Ancients were we saw some of those cliff dwellings for the first time – absolutely amazing!